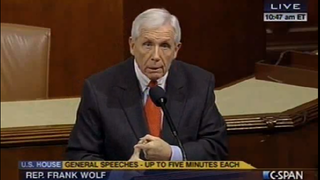 Here's Rep. Frank Wolf of Virginia, who has served in the House of Representatives since 1978. He chairs the House subcommittee that funds the National Science Foundation. Yesterday he took the floor to complain that the Obama administration was ignoring its friends in the entertainment industry while demonizing the National Rifle Association, which is baloney. President Obama may not have mentioned violent video games in his State of the Union speech, but he's damn for certain called for federally funded studies into violent media—specifically naming video games in a statement about the proposal—and his vice president convened a meeting with video game makers to ask them to clean up their image. What's hilarious to me about this boilerplate hackery comes at 2:36, when Wolf stops and stares directly into the camera for a good two seconds. He seems to realize he's answered his question about what's really the problem here. See for yourself.